Check this website daily during Alaska's Special Legislative Session for current status of Alaska gas pipeline dialog. Also refer to the following websites for updates from many perspectives: AGIA Website, Denali - The Alaska Gas Pipeline, TransCanada Website, Alaska Natural Gas Development Authority, Alaska Gasline Port Authority, Andrew Halcro Blog, Mackenzie Gas Project, Alaska Support Industry Alliance Comparison and song. 6-30-08. "Joe American" Challenges the Presidential Candidates". * FDNM Editorial. A half a billion dollars might not seem like all that much to some people when considering that the state of Alaska might see a $9 billion surplus at the end of the current fiscal year. But half a billion — $500 million — is truly a big load of bucks. That’s why legislators considering whether to give that much money to Canadian pipeline company TransCanada for construction of a natural gas pipeline from the North Slope need to think hard before making that decision. They need to be certain that the expense is actually necessary and that forces aren’t already at work which will ultimately see TransCanada unite with BP and ConocoPhillips on those companies’ own gas pipeline plan. * Calgary Herald, Archie Mclean, The Edmonton Journal, JACKSON HOLE, Wyoming - Alberta found some allies Sunday at a meeting of governors of western U.S. states, when a pair of lawmakers defended the oilsands and suggested Canada continue to ramp up its output in the face of environmental concerns. "I look forward to the day that we markedly increase the oilsands production," said Montana Gov. Brian Schweitzer, a Democrat. 6-29-08. ADN, PNA, by Eric Lidji. On the natural gas fight card this year, the main event is clearly the big pipeline: Denali, created by BP and Conoco Phillips, squaring off against TransCanada, backed by the state and looking for legislative approval. That's undoubtedly the heavyweight match, but there is a highly competitive undercard as well: two smaller proposals for bringing northern gas to markets in Southcentral Alaska. The Alaska Natural Gas Development Authority, or ANGDA, wants to build a spur line connecting the mainline to Anchorage, while Enstar Natural Gas Co. wants to build a "bullet line" connecting gas fields in the Brooks Range northern foothills to Anchorage. 6-28-08. Global Petroleum Survey: key Arctic gas pipeline areas, Alaska and Northwest Territories, are among worst oil and gas investment climates while Saskatchewan has pulled ahead of Alberta. Politicians be aware. -dh * AP by John Willen, NEW YORK -- Oil futures climbed to a new record near $143 a barrel Friday as the dollar weakened against the euro, confirming expectations that the falling greenback, a major factor in crude's stratospheric rise, will extend its decline and add to oil's appeal. * ADN by Eric Lidji. A group of independents exploring the North Slope is discussing strategies for how best to develop a series of Gwydyr Bay oil prospects, according to a partner in the joint venture. 6-27-08. Andrew Halcro, an AGIA Point and Counterpoint. * ANCHORAGE, Alaska (Reuters) - The Federal Energy Regulatory Commission on Wednesday granted a request from BP and ConocoPhillips for an early review of a plan for a $30 billion (15.2 billion pounds) natural gas pipeline from Alaska's North Slope through Canada to the lower 48 U.S. states. * FDNM. Could Alaska’s second-largest city consider turning off street lights and depriving residents of holiday lighting displays during the darkest time of year because it can’t afford its electric bill? * Globe and Mail by Dawn Walton. PRIDDIS, ALTA. — The space telescope will be no bigger than a hefty suitcase and weigh just 65 kilograms, but the Canadian scientists behind the project say when the device is launched two years from now, it may well go on to save the world. 6-26-08. Andrew Halcro. On Monday we posted a piece about rolled in rates, outlining one of several reasons why producers would be reluctant to ship gas in TransCanada's proposed AGIA pipeline. * ADN by Tom Kizza. HOMER -- While disappointment left coastal Alaska in a stormy mood Wednesday, the smaller Exxon punitive damages amount set by the court -- about $1 billion, including 5.9 percent interest -- promises to inject real money into the state's fishing communities. * CNN. WASHINGTON -(Dow Jones)- U.S. regulators Wednesday approved a procedural request allowing developers to move ahead with an application for a major new natural gas pipeline from Alaska to the lower 48 states. 6-25-08. Tempus Fugit. Yes, we could raise the moratorium on development offshore in British Columbia. Yes, we could build the Mackenzie Valley pipeline. Offshore BC is a decade away if we start now. * ADN by Erika Bolstad. WASHINGTON -- The U.S. Supreme Court dashed the hopes of more than 32,000 fishermen and Alaska natives who have been waiting for nearly 20 years to hear whether Exxon Mobil Corp. will have to pay out billions in punitive damages for its role in the 1989 Exxon Valdez oil spill. 6-23-08. The Ear, ADN. 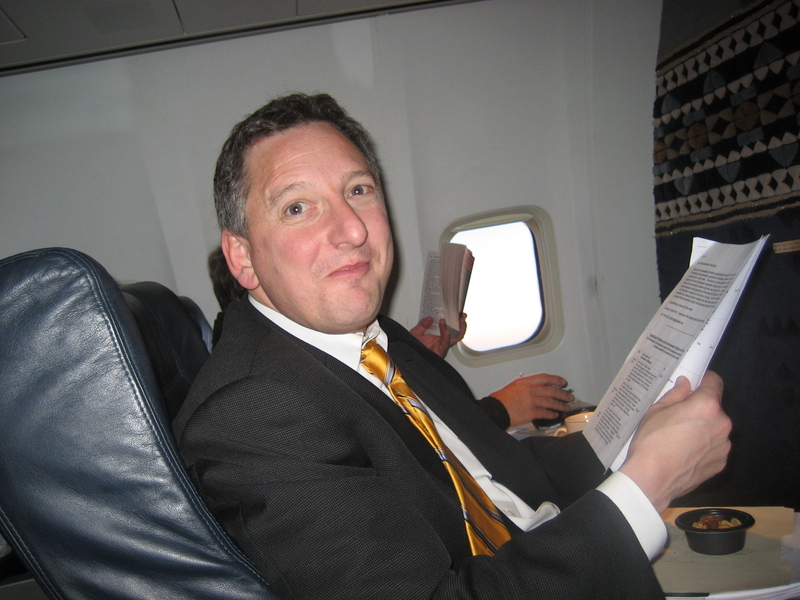 A QUESTION ... Is John Binkley head of the Alaska Cruise Association, absolutely positive the Senate coalition is doomed? How else to explain why an experienced politician and lobbyist like him is sponsoring a fundraiser for Dave Harbour (right), who is running against majority incumbent Sen. Bettye Davis? Bettye's colleagues in the Senate are not amused. (Note: I've always thought well of John (from the old days when I volunteered to help his Dad promote tourism in Alaska. The Binkleys--like the Nerlands and Sullivans and Marstons and Atwoods and Hickels and Reeves--deserve more appreciation and recognition from us for what they have done to help the state and employ its people -dh) and Bettye (I came to know and respect her when I served as Anchorage Chamber of Commerce Chairman. -dh 7-8.) * Voice of the Times Editorial: WE ADMIRE former Gov. Wally Hickel. A lot. He’s a guy with huge ideas and a vision for this state too often lacking in the lesser politicians of today. But he is dead wrong about the state building and owning a liquefied natural gas line that would run from the North Slope to Valdez. * PNA by Eric Lidji. As reported in last week’s issue of Petroleum News, Bud E. Fackrell is the first president of “Denali-The Alaska Gas Pipeline,” a joint venture between BP and ConocoPhillips created in April and charged with the task of building a natural gas pipeline from the North Slope to markets in the Lower 48. * KTUU by Bill McAllister. ANCHORAGE, Alaska -- The Alaska Gasline Port Authority says its all-Alaska project has new life thanks to a new partnership with Japan's Mitsubishi Corporation. 6-22-08. AJC by Tim Bradner. 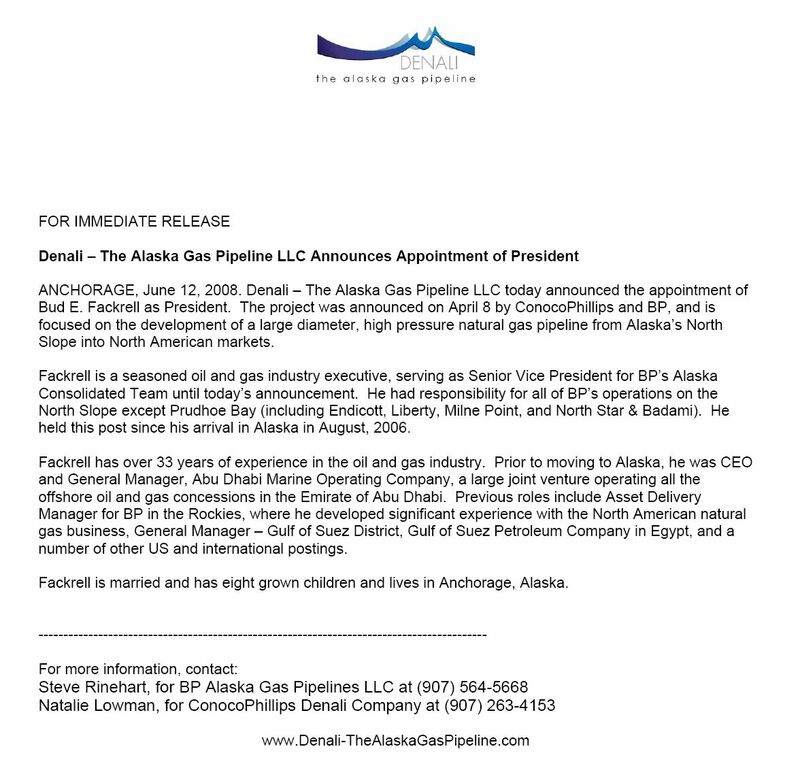 Veteran Alaska BP manager Bud Fackrell was named to head the new Denali gas pipeline project. Parent companies BP and ConocoPhillips named Fackrell as president June 12. * PNA by Eric Lidji. The Alaska Natural Gas Development Authority, or ANGDA, wants to build a spur line connecting the mainline to Anchorage, while Enstar Natural Gas Co. wants to build a “bullet line” connecting gas fields in the foothills of the Brooks Range to Anchorage. The two projects hope to solve the same problem: declining production in Cook Inlet threatens to cause a shortage of natural gas supplies in Southcentral Alaska. According one forecast, that shortage could start to be felt as soon as 2014. 6-21-08. ADN Op-Ed by Andrew Halcro. On Monday, two FERC officials from Washington, D.C., testified before the special legislative hearings on AGIA in downtown Anchorage. They spent a few hours dispelling pipeline myths while offering answers that hopefully quiet certain lawmakers who have made a second career out of peddling pipeline fear to Alaskans. * June 20, 2008, Juneau, Alaska – Governor Sarah Palin today released a draft bill proposing a special one-time payment in the amount of $1,200 to Alaskans and suspending the state fuel tax for one year. The legislation is intended to be a starting point for a discussion with the legislature about how to provide relief from high energy costs to working Alaskans and their families. Radio actualities of Governor Palin’s interview with Channel 2 KTUU reporter Jason Moore on the draft energy bill can be found at the following link: http://www.gov.state.ak.us/audio/EnergyPlanQnA_06-20-2008sm.MP3. 6-20-08. ADN by Wesley Loy. Shell says it's giving up on plans to drill in the Beaufort Sea this year due to an unresolved court challenge. PNA via ADN. Everyone seems to expect that gas from the Point Thomson field will be part of what initially fills a gas pipeline taking North Slope natural gas to market. ADN Editorial. Has the Palin administration hurt prospects for a gas line by taking a tough stand against extending state oil and gas leases at Point Thomson? * FDNM by R.A. Dillon. WASHINGTON -- The owners of the trans-Alaska oil pipeline overcharged for shipping oil to refineries located outside of Alaska and must refund a portion of the excess revenue collected over the past four years, federal regulators said Thursday. 6-14-08. Author will be hosting drilling moratoria panel (MMS and BLM) at a Commissioner meeting beginning this weekend in Montana (Note: Calgary (speaker), Montana (MMS-BLM moderator), Portland, 7-22 Gas Committee (Speaker), Anchorage (Conference Chairman) agendas). Daily reports will resume as soon as possible. 6-13-08. Denali-The Alaska Gas Pipeline names new President, Bud Fackrell (Release, left). * Scandinavian Oil and Gas. Oil companies have until the end of November to bid in the Canadian maritime province Newfoundland and Labrador’s “2008 land-sales” round, the first of its kind in half a decade. * ADN. JUNEAU -- State Natural Resources Commissioner Tom Irwin on Wednesday reaffirmed his earlier decision to break up the Point Thomson oil and gas field. AP. The mayor of the Fairbanks North Star Borough (Photo-r, Jim Whitaker with Dave Harbour -l), a board member of the Alaska Gasline Port Authority, is supporting Gov. Sarah Palin's approach to building a natural gas pipeline and her decision to back Canadian pipeline builder TransCanada Corp. * ADN by Wesley Loy. JUNEAU -- Now that Alaska legislators have wrapped up a week of natural gas pipeline hearings in the state capital, they're heading out on an unusual, likely unprecedented, "road show." * ADN Editorial: Bullet Line. During the Legislature's review of TransCanada's gas line proposal, an important question has surfaced. Would approving the TransCanada deal hurt chances for a bullet line, such as Enstar is considering? * EAR. Dave Harbour and Bettye Davis. * Wyoming Pipeline Authority. BP and ConocoPhillips “Denali – the Alaska Gas Pipeline”: 2,000 mile, 4 Bcfd natural gas capacity pipeline from Prudhoe Bay Alaska to Alberta, British Columbia, Canada. http://www.denali-thealaskagaspipeline.com/. 6-12-08. Voice of the Times. SOMETIMES THEY GET it right in Washington. Proof came Monday with the announcement that Gen. Norton A. Schwartz has been nominated to become the 19th Air Force chief of staff. ADN. The representatives — Wes Keller, Bill Stoltze, Mark Neuman and Carl Gatto — hope to collect input from Valley residents on a proposed gas pipeline. State lawmakers have 60 days to decide on a plan by TransCanada to build a line 1,715 miles long from the North Slope to Calgary, Alberta. Light refreshments will be provided at the town hall at the Legislative Information Office, 600 E. Railroad Ave., Wasilla. * ADN by Erika Bolstad. WASHINGTON - The U.S. Supreme Court still hasn't released a decision on the Exxon Valdez case. * VOT by Alan Reynolds. The price of crude oil has jumped as high as $135 lately, up from $87 in early February. The news encouraged some Wall Street analysts to suggest oil might approach $200 before long. In fact, that's quite impossible: The world economy can't handle current energy prices, much less a big increase. * ADN by Erika Bolstad. WASHINGTON -- As Congress has debated energy policy over the past several days, an unusual argument keeps surfacing in support of drilling in Alaska's Arctic National Wildlife Refuge. * SO&G. Pioneer Natural Resources Co. and Italian oil company Eni are on their way to producing plateau production of 20,000 barrels of oil per day from the 90-million-barrel Oooguruk oilfield in Alaska. 6-11-08. Voice of the Times by Tom Brennan. BP chief executive Tony Hayward gave a speech in Kuala Lumur last week that didn't mention Alaska by name but certainly could have. * ADN, by Anne Sutton. JUNEAU -- Gov. Sarah Palin has promised Alaska lawmakers they will be called upon this summer to address the immediate energy needs of Alaskans. * AJC by Tim Bradner (NGP Photo, 5-23-02). Of particular concern to lawmakers is what the state will get for a $500 million grant to TransCanada to pursue the pipeline, the implications of a treble-damages provision in the deal that would kick in if the state helps a competing pipeline, and whether the TransCanada deal could complicate or impede a separate pipeline effort now underway by BP and ConocoPhillips. * Juneau Empire by Pat Forgey. The Legislature has scheduled from 30 to 60 days to consider a TransCanada Corp. plan to build a $28 billion gas pipeline. Some legislators are saying Gov. Sarah Palin's gas line team, along with TransCanada, has already made its case. * Winston and Lynda Blog. Actually, our excursion of yesterday took us, only with the car, over 200 miles away up the Elliott highway, paved, (where we encountered Joy) to the Dalton highway, mostly gravel, and up to the Arctic Circle. The Dalton is known as the 'Haul' road. It more or less follows the Alyeska Pipeline , Trans America Pipeline all the way to Prudhoe Bay at the Arctic Ocean. 6-10-08. Fort Mill Times, by Anne Sutton. JUNEAU, Alaska — As state lawmakers continue their review of a plan to build a multibillion dollar natural gas pipeline from the North Slope to a hub in Alberta, Canada, one issue appears never far from their minds. They want to know how much gas would be available for state residents, and if granting TransCanada Corp. an exclusive state license would make it harder to get that gas quickly and economically to local markets. * KTUU by Heather Balderson. ANCHORAGE, Alaska -- In addition to discussing TransCanada's gas line proposal this week, the Palin administration also offered its thoughts on an all-Alaska liquefied natural gas export project. * 3-D Technology. Continuing the public relations push to convince people their gas pipeline project is better, representatives from oil giants BP and ConocoPhillips were in town last week, just eight days after a governor's representative was here stumping for the TransCanada line. * Moose In The Yard - Way Up North. The Governorette is still pushing her choice for the natural gas pipeline. Trans-Canada, which is in the business of building & running pipelines, is the only company which met all the State's criteria for submitting a proposal. The line would be over 1,700 miles long, and would go through Canada on its way to the Lower 48. 6-9-08. FDNM, by Stefan Milkowski. JUNEAU — Led by Rep. Jay Ramras (NGP Photo-l), state lawmakers grilled Gov. Sarah Palin’s administration again Saturday on the question of whether its gas line plan pays enough attention to the need for affordable energy in Alaska. * Peninsula Online by Phil Hermanek. Continuing the public relations push to convince people their gas pipeline project is better, representatives from oil giants BP and ConocoPhillips were in town last week, just eight days after a governor's representative was here stumping for the TransCanada line. A week ago, Bruce Anders told about 75 civic and business leaders in Soldotna that TransCanada's natural gas pipeline proposal is the only one that meets the requirements of Gov. Sarah Palin's Alaska Gas Inducement Act (AGIA) and is the one most likely to be approved by the Federal Energy Regulatory Commission. 6-8-08. PNA by Alan Bailey. On June 3 the U.S. Department of Energy approved two more years of natural gas exports from Alaska’s Cook Inlet to Asia. The approval was in response to a request from Nikiski LNG plant owners ConocoPhillips and Marathon to extend the plant’s export license for two years, from April 1, 2009 to March 31, 2011. * ADN by Wesley Loy. JUNEAU -- OK, listen up. Are you baffled by this whole natural gas pipeline thing? Are you wondering why Alaska legislators and Gov. Sarah Palin are stuck in Juneau in June instead of out fishing for salmon? Don't have any idea who TransCanada is, or how "Denali" could be anything but a mountain? * ADN editorial. $500 million - Here's what that money buys if the Legislature approves it. * Dan Fagan Op-ed. The experience of fighting for what you believe in is one of the true gems of life. Especially when your struggle and stand come with a cost. People are inspired when someone does the unpopular thing just because it is right. 6-7-08. ADN by AP. ST. PETERSBURG, Russia - Russian natural gas monopoly OAO Gazprom is angling for a role in a proposed Alaska gas pipeline, the company's chief said today. * PNA. Roy Innis believes affordable energy is a civil rights issue. Innis brings some legitimacy to that claim. For the past 40 years, he’s been the national chairman of the Congress of Racial Equality, or CORE, one of the oldest civil rights organizations in the country. For decades he’s fought for social and political reform for black people in America, including the historic battles of the 1960s. * ADN Editorial. To some Alaska skeptics, the state is preparing to make a $500 million North Slope gas line deal with an unknown company that has questionable credentials. 6-6-08. ADN by Wesley Loy. JUNEAU -- A top adviser told Alaska legislators Thursday he sees no major reason why they shouldn't vote to award a state license and half a billion dollars in seed money to a potential natural gas pipeline builder. PNA. Proposed legislation in the U.S. Congress aimed at reducing greenhouse gases would make more than one third of all domestic natural gas projects uneconomic, according to a new report from the research and consulting firm Wood Mackenzie. Commissioned by the American Exploration and Production Council, the report looks at how the Climate Security Act of 2007, specifically provisions requiring producers to pay for greenhouse gas emissions by consumers, would impact the upstream economics of natural gas projects across the country. 6-5-08. ADN by Wesley Loy. JUNEAU -- Alaska legislators on Wednesday hit the court to start reviewing Gov. Sarah Palin's plan for a natural gas pipeline. * Mackenzie Gas Project. The proposed Mackenzie Gas Project is expected to create thousands of short-term jobs over three winter sessions during the peak construction period. About 45 to 55 long-term employee jobs are forecast for pipeline and related facilities operations. In addition, there may be 35 to 45 contractor jobs associated with the overall Project operations activity. * World's largest selection of petroleum industry short courses and seminars: PEICE. * PNA. One current and two former senior executives with the Bureau of Land Management in Alaska received Presidential awards for service on May 28. Thomas P. Lonnie, state director for the BLM in Alaska, received a Presidential Meritorious Service Award, while BLM Deputy Director Henri R. Bisson and Linda S.C. Rundell, State Director for BLM-New Mexico, each received a Secretary’s Executive Leadership Award, Silver. 6-4-08. CNN, AP. The clock starts ticking for Gov. Sarah Palin on Tuesday. She'll have 60 days to convince the Legislature that TransCanada Corp. deserves a license to build a pipeline that would ship North Slope natural gas to power homes and businesses in U.S. markets. 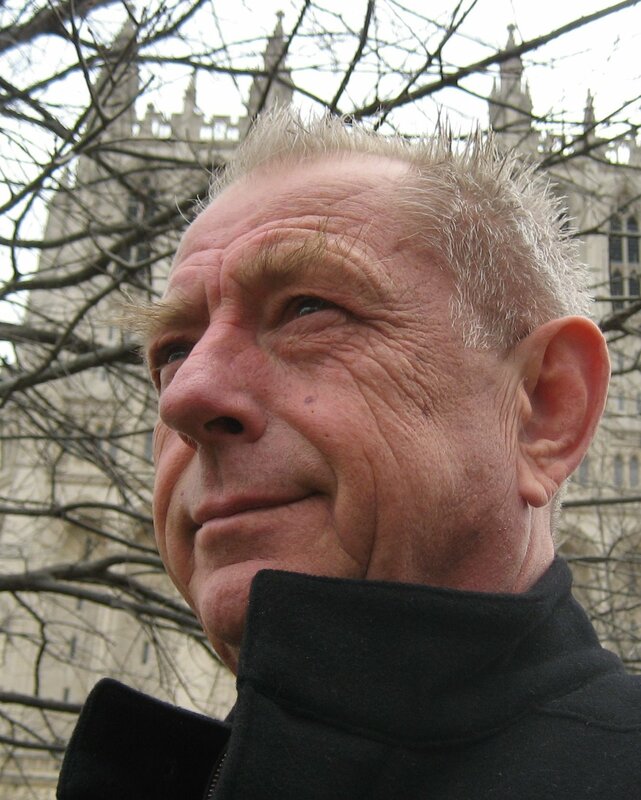 * FDNM, by R.A. Dillon. WASHINGTON — Sens. Ted Stevens and Lisa Murkowski are concerned that landmark climate change legislation slated to come to the Senate floor today could harm Alaska’s economy. * ADN by Steve Quinn. JUNEAU -- If the Alaska Legislature awards TransCanada Corp. a license to pursue a natural gas pipeline this summer, it will come with a hearty price tag: as much as $500 million. * ADN by Tom Kizzia. Village electric utilities in rural Alaska, panicked over the sky-high cost of fuel arriving on the summer's first barges, are appealing to the state for help. * ADN by Wesley Loy. JUNEAU -- The U.S. Department of Energy on Tuesday approved two more years of natural gas exports from Cook Inlet. 6-3-08. ADN, AP by Steve Quinn. JUNEAU - If the state Legislature awards TransCanada Corp. a license to pursue a natural gas pipeline this summer, it will come with a hearty price tag: as much as $500 million. * Calgary Herald by Jon Harding. TransCanada Corp.'s $26-billion US plan for a natural gas link from Alaska to Alberta will be the focus of a heated public debate in Alaska over the next several weeks starting today. 6-2-08. ADN by Wesley Loy. I flew into the capital this evening – took the milk run from Anchorage through Cordova and Yakutat – and found no sign of any legislators, at least not during my stroll through downtown. * NEWSWEEK, by Tony Hopfinger (NGP Photo, 1-15-02-l). As Americans feel the pinch at the gas pump amid $128 a barrel oil, there's at least one place in the United States where high energy prices aren't all bad news. Alaska, home to America's prolific oil fields, is reaping billions of dollars in record oil-tax revenue. That, along with a populist governor determined to deliver a megapipeline project to the state, is fueling optimism am ong Alaskans that an energy boom may be just around the corner. 6-1-08. Anchorage Times. ALASKA LEGISLATORS, preparing for yet another special session opening late Tuesday afternoon, are up to crunch time when it comes to dealing with a rookie governor making a full-blown political career out of her bubbling smile. * ADN. Republican Dave Harbour (NGP Photo-r), former head of the downtown parking authority and more recently a Murkowski appointment to the Regulatory Commission of Alaska, has filed against the incumbent Democrat.